The first one arrived yesterday. In case you were wondering, yes, it’s quite mundane packing it up. But then, out of the blue, some ducks landed in my pool, there were three before one flew away. Were they taking a break or looking for a new home? I guess we’ll find out. Maybe they heard you might be selling your home, gotta check out the pool first if you’re a duck! I love seeing wildlife…although I have to admit, for me seeing them in a pool is different! Everything around me here is so country. I see you met my relatives! Never had ducks in the pool that I know of. Waiting on lumber yard to deliver the rest of the deck. 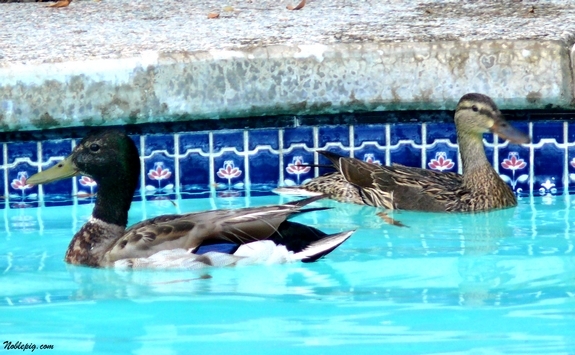 Aren’t ducks in the pool what drove Tony Soprano into therapy? 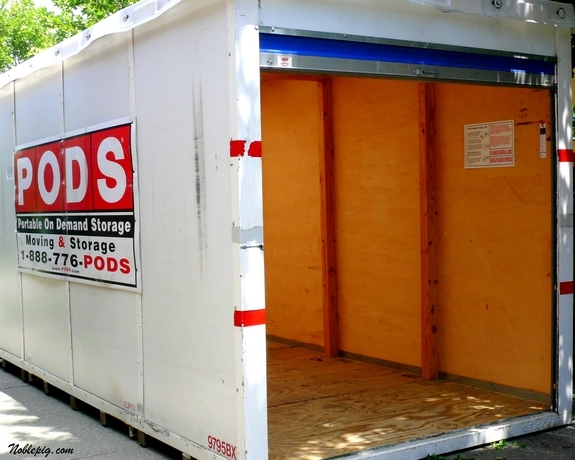 Have fun packing the POD! Didja feed them some bread cubes? Ill be packing up soon myself. NOT looking forward to it..
PODS are the best. And I think those are my ducks…. I suppose they want you to hurry up and pack? That is awesome. Ducks in the pool. I’ve never seen that before! Good Luck with the packing, Cathy. I do not envy you. OMG–that Pod is all-too-familiar for me! I hope it won’t be too much longer until we get our house stuff worked out and get it back. Love the ducks in the pool! Hmm, packing, moving, I know exactly what you feel. Beautiful duckies. I had this experience few years ago, it cute when the first time we saw them, then it became pests, lol. Thanks goodness they never came back up to now. I have to know . . . the ducks. Were there two males and one female? Around here we are seeing a proliferation of males with only a sprinkling of females. Does this mean the Mamas are all sitting on eggs and the Dads are out playing? Ugh. Packing. It’s. The. Worst. Have fun. I guess ducks in the pool are a nuisance,but they sure are cute! Yes, there were two males which I thought was strange. That is so cool, great pic……. Yikes is right, but you’ll be saying Yippee soon when it’s all done, and BEST thing about moving is you lose weight! Maybe their getting ready to follow you to Oregon! I don’t envy you the packing or the ducks! Have fun filling those PODS! Things look like they’re really starting to happen. When is moving day? I was thinking that picture was familiar and then realized it’s almost identical to MPM’s duck photo, lol. Ahhhh!! They came to tell you goodbye! What an awesome photo! They’ll stay if you don’t try to use their new pond. And then, the leavings….SWIM, CATHY, SWIM! Send the Piglets (AKA Hooligans) swimming, too! Wow, the move is ever that much closer! Have a good, if not busy!, weekend! I think the ducks heard you were going to be having a vacancy soon. And that the food is to die for. Good luck with the move, Cathy. If I can lend a hand in any way, please let me know. Wow. That really does drive it home. Massive undertaking! It is sooo COOL that those ducks just lighted in your pool. Must have needed cooling off! GL with the packing! We’ve had ducks in our pool every spring for the last ten or so years!!! My brother and I named them and most years they would make a nest and raise little ducklings! It’s pretty hilarious to watch the mother duck trying to convince her ducklings to jump into the water for the first time, they squawk and quack like crazy but then one does and then they’re all in. They are very cute and we don’t see them as pests at all, but don’t let your boys get attached because they only roost for about 2-3 weeks. This year, instead of our usual momma and poppa ducks, we just had the poppa duck and several other males. Very curious. Wow that thing is big! How many do you have to pack up?? You have your work cut out for you!! We moved all the time when I was a kid (I went to 6 different grade schools) and I knew how to pack a whole house when I was ten (yes 10). I am fortunate to be in a home that I will not leave for several years. I would help if I could! I am pretty good at it. Take care. I don’t envy you at all. Maybe the ducks are just hanging around to give you a cheerful farewell?! Ducks in the pool, huh? Somebody told them the space was for rent!! Don’t envy you the move…but what awaits sure looks good to me! Good luck! I like your new pets :). Good luck with packing! Wait a minute! Those are Mental P’s ducks! WHAT are they doing on the West Coast??? I don’t know, to me that container looks pretty darned exciting. That means a change is acoming on! Maybe you could slip in a break like the ducks in between loading those pods….bless your â™¥! Not fun to move…thinking of you. I know that I’m not supposed to say this, but I loathe and despise ducks with every fiber of my being…well, I have more of an abhorrence for GEESE (giant sky rats) but ducks come pretty close. And here I thought you were keeping the ducks in the pool for dinner later. The only good thing about moving is you go through all you stuff. Amazing how many of the items you thought were treasures never to be parted with, become really unimportant! I don’t know, but sometimes I think moving would actually be fun. I know there is tones of work involved… but it just seems exciting to me! Maybe when I get around to doing it myself I’ll search this post in the archives and take it all back! Nice cake though, glad you can still enjoy it when it didn’t go exactly to plan!